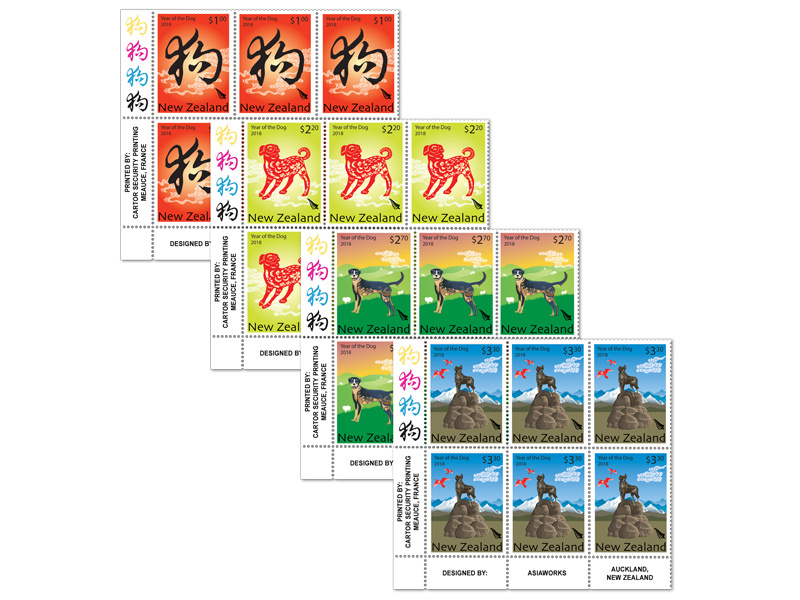 The dog is the 12th animal in the Chinese lunar calendar. People born in this year tend to have decisive, loyal and loving personality traits which can make them fierce and long-lasting friends. But, because they have quite cautious characteristics, they can take time to form these bonds, and can be easily distressed if trust is broken. 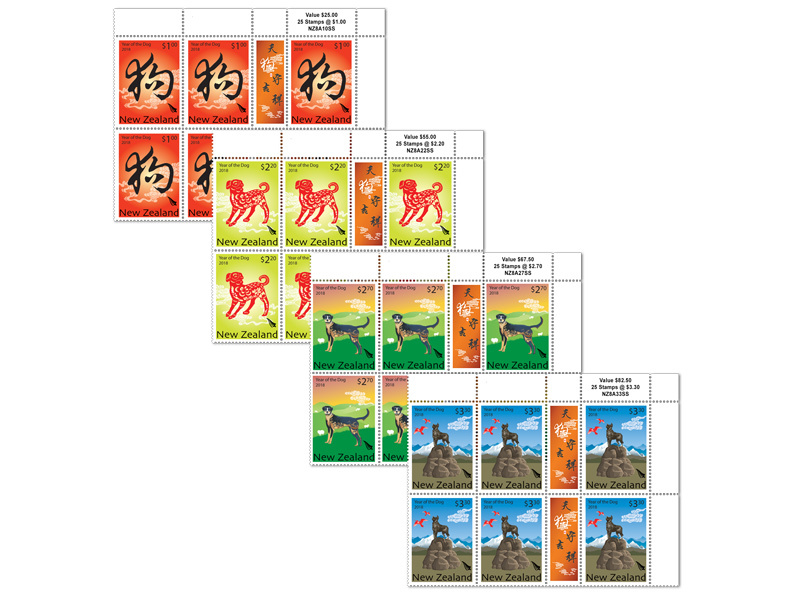 The Chinese lunar calendar is based on observations of the Sun and Moon and is used for traditional activities in China and in overseas Chinese communities. 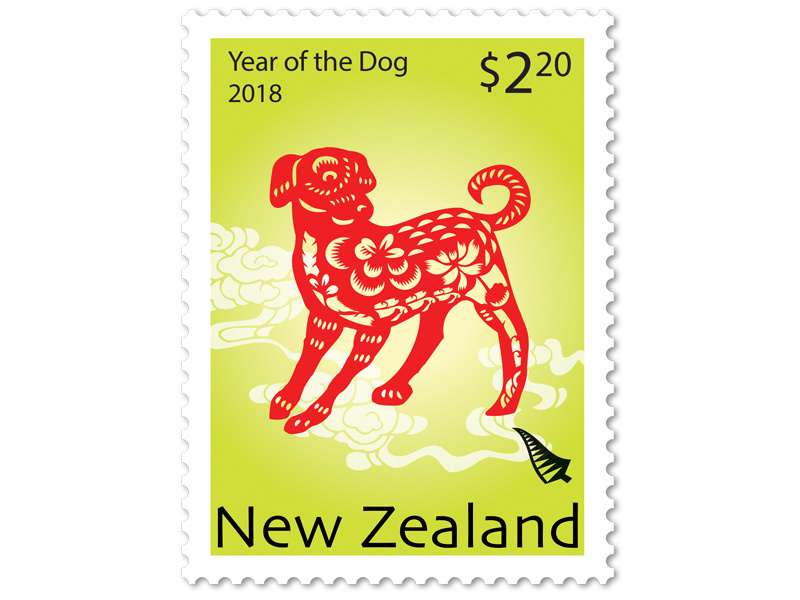 It determines the date for traditional Chinese holidays, and guides Chinese people in selecting the luckiest day for a wedding or funeral, or for beginning a new venture or relocating. 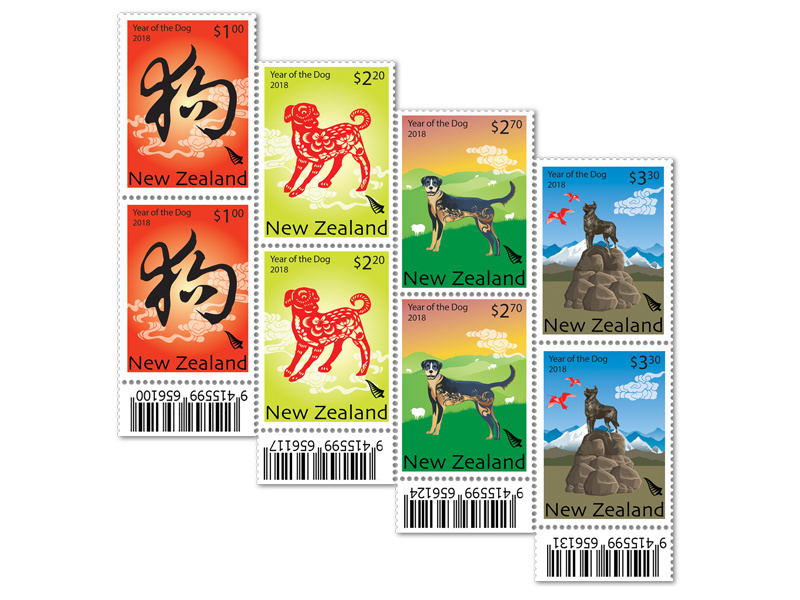 The Chinese New Year celebration is dominated by the traditional Chinese colour, red. It reflects a positive, warm, and peaceful atmosphere. 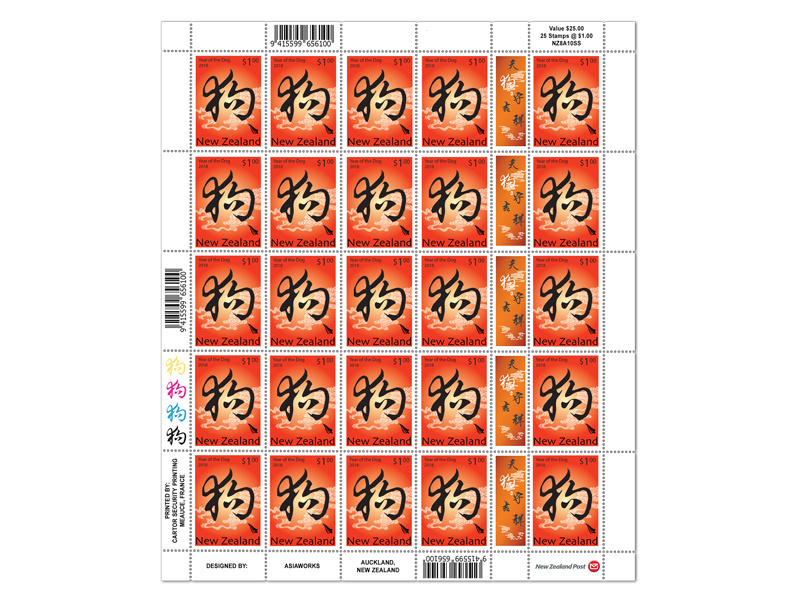 Calligraphy is another traditional Chinese New Year element used for household scrolls and art exhibitions. 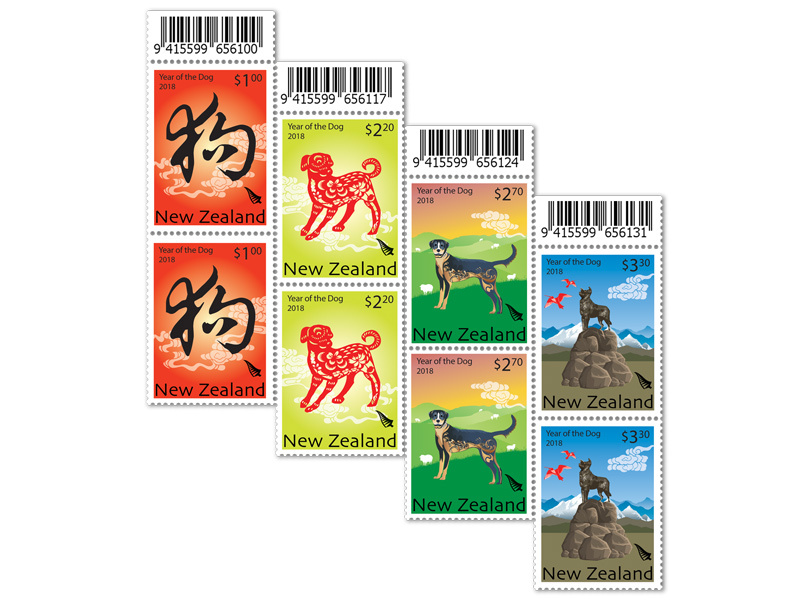 Here, the cloud pattern is a metaphor for good luck in Chinese and ‘the land of the long white cloud’ New Zealand. Paper-cutting is one of the styles of Chinese folk art that can be traced back many years. 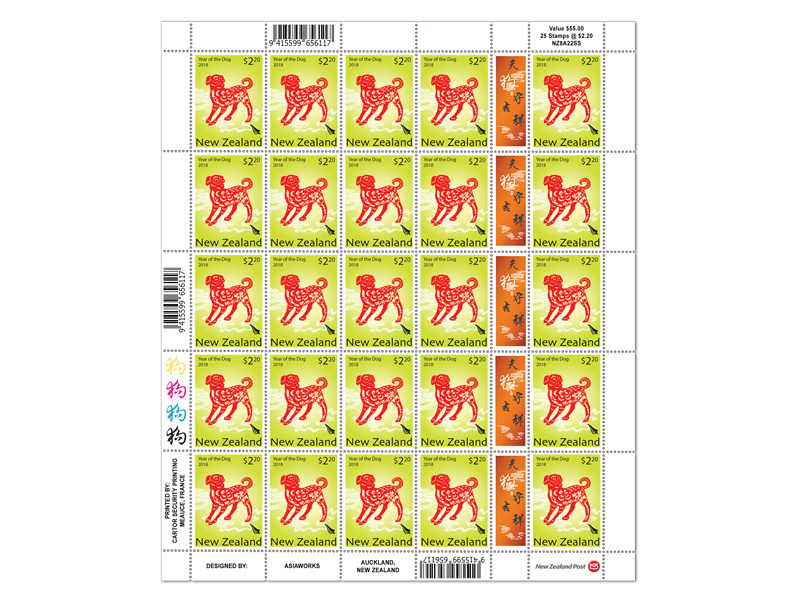 It’s specifically designed for the Chinese New Year celebration, and symbolises respect of this traditional Chinese art form. It’s commonly used to decorate house or shop windows. It’s also given as a gift to guests and friends on all occasions. 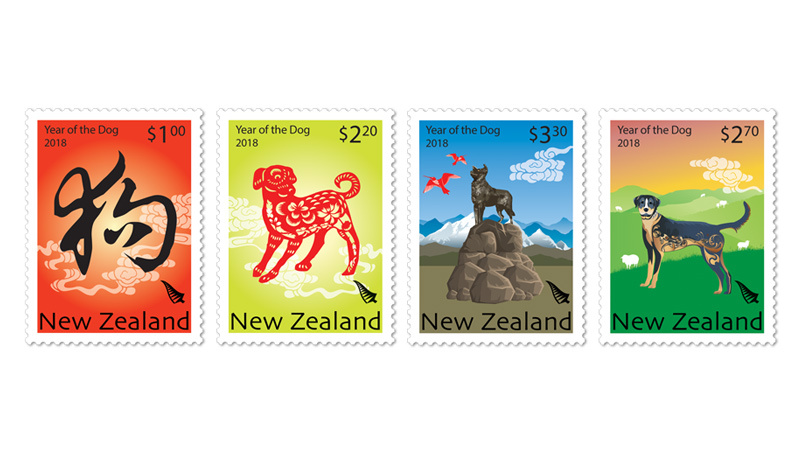 The paper-cutting of the dog is the best element of this set of stamps. 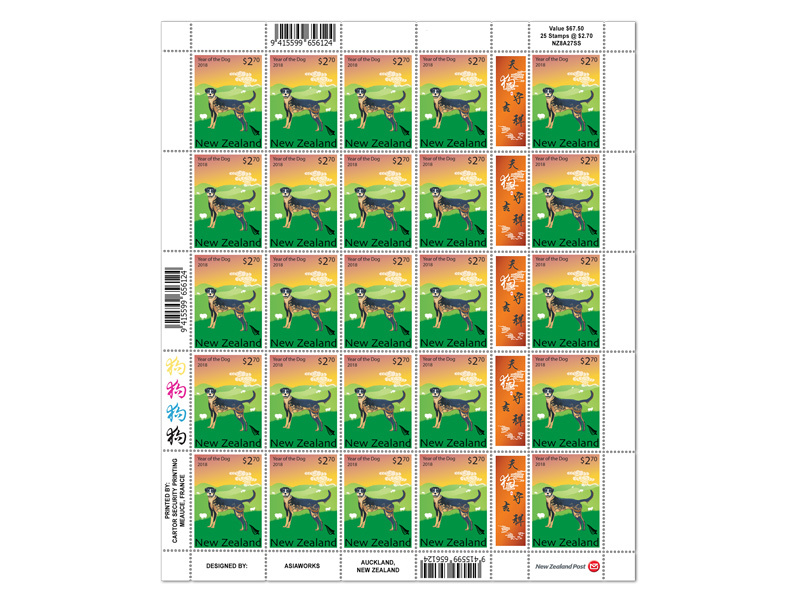 This stamp shows a rural backdrop of rolling green pastures with grazing sheep, which New Zealand is famous for. 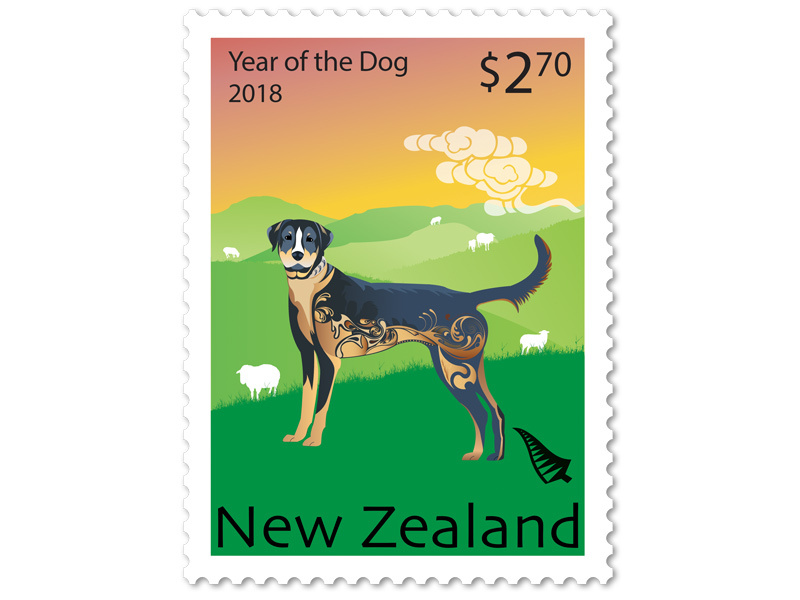 The working dog plays an important role in New Zealand sheep farming, the Huntaway is illustrated here using a form of line art. 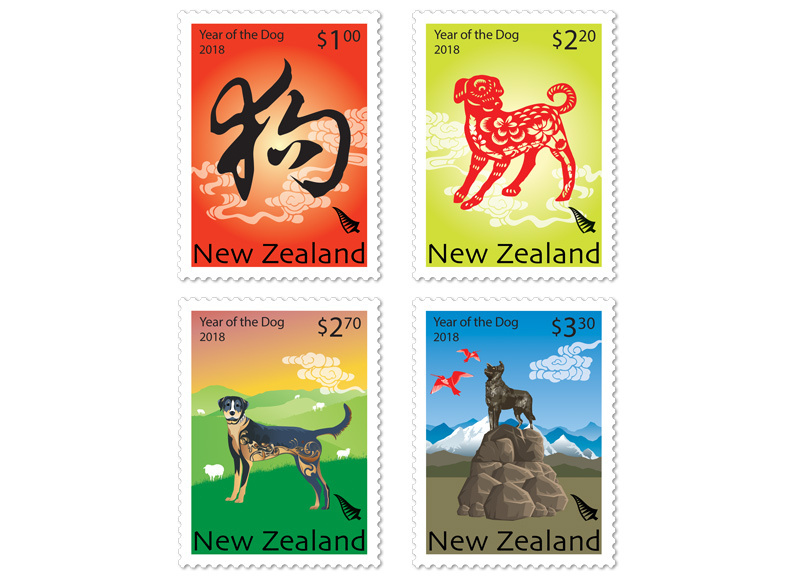 Inspiration was also taken from Māori and Pacific art works, with elements that help to link New Zealand and the Year of the Dog. 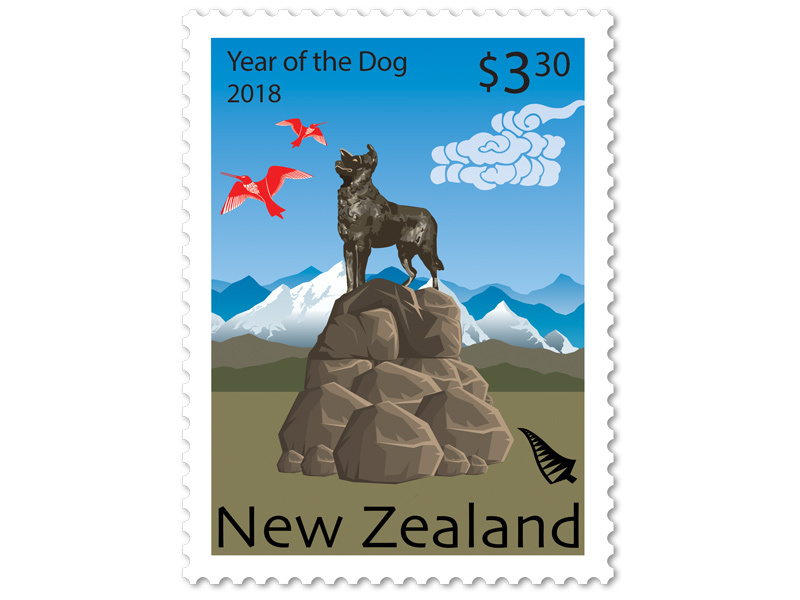 The working dog, most commonly Border Collies and Huntaway’s, play a key role in farming the high country areas of the Mackenzie Basin near Tekapo. 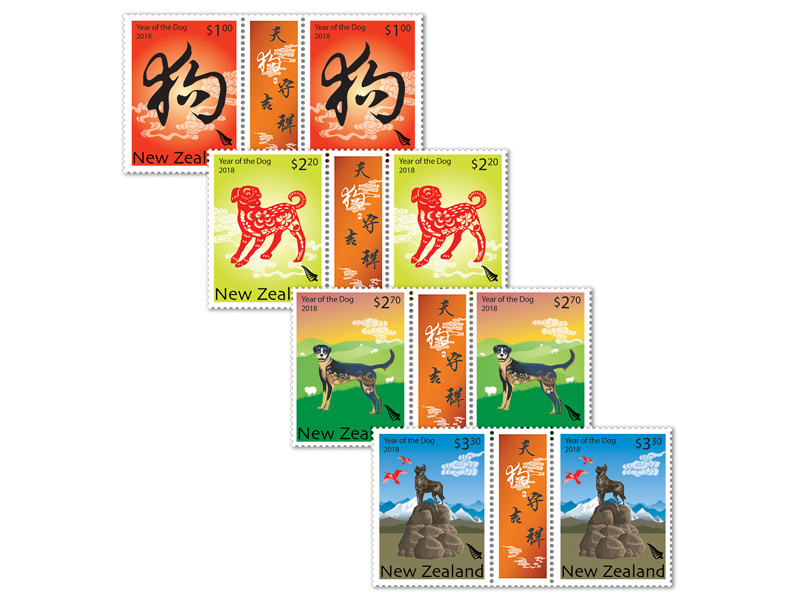 A bronze statue was erected in Tekapo as a tribute to these hardworking dogs. 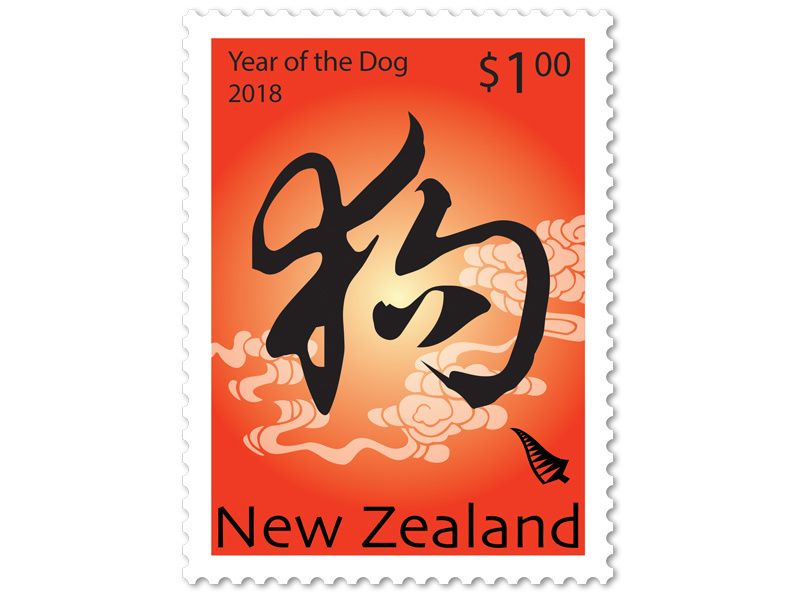 This stamp design shows this New Zealand landmark as it relates to the Year of the Dog. Images of migrant birds, godwits, which fly between New Zealand and China on their way to Alaska can be seen in the background. These birds reflect the good relationship our two countries share.